Caspofungin is an antifungal drug that works by inhibiting the enzyme (1→3)-β-D-glucan synthase, thereby disturbing the integrity of the fungal cell wall. Caspofungin acetate was first approved by the U.S. Food and Drug Administration (FDA) on January 26, 2001, then by the European Medicine Agency (EMA) on October 24, 2001, and approved by Pharmaceuticals and Medicals Devices Agency of Japan (PMDA) on January 18, 2012. It was developed and marketed as Cancidas by Merck Sharp & Dohme (U.S.). 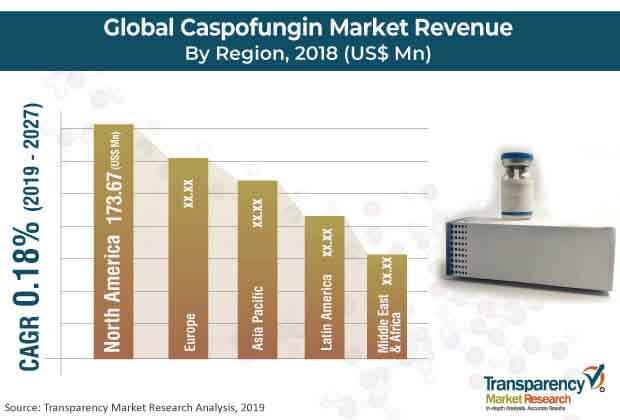 The global caspofungin market was valued at US$ 496.20 Mn in 2018 and is anticipated to reach US$ 484.60 Mn by 2027, expanding at a CAGR of 0.18% from 2019 to 2027. Rise in prevalence of candidiasis, increase in usage of echinocandins, surge in disposable income in the emerging countries, and rise in awareness among people about preventive measures of various microbial diseases are factors projected to propel the global market during the forecast period. The incidence and prevalence of invasive candidiasis are rising significantly across the world, affecting millions of people. Increase in incidence of candidaemia in ICUs has been reported in several parts of the world. According to the Extended Prevalence in Intensive Care (EPIC) II point prevalence study, Candida spp. is the third most recurrent cause of infection in ICUs across the globe, accounting for 17% of all ICU infections in culture-positive infected patients. Moreover, according to the U.S. Department of Health & Human Services, invasive candidiasis is one of the common health care-associated infections. Around 46,000 cases of invasive candidiasis occur each year in the U.S. Candida species are ranked fifth among hospital-acquired pathogens and fourth among nosocomial blood stream infection pathogens. Increase in incidence of invasive candidiasis is expected to be a major factor likely to boost the global caspofungin market during the forecast period. The global caspofungin market has been segmented based on indication, distribution channel, and region. In terms of indication, the candidiasis segment is projected to account for major share of the global market during the forecast period. Caspofungin has been approved as first line of treatment of patients suffering from invasive candidiasis and who are resistant to other antifungal agents. It has been also approved as first line of treatment for different forms of candidiasis such as esophageal candidiasis, intra-abdominal abscesses, peritonitis, and pleural space infections. The preferred use of caspofungin over other antifungals in certain diseases is likely to propel the market during the forecast period. In terms of region, the global caspofungin market has been segmented into North America, Europe, Asia Pacific, Latin America, and Middle East & Africa. Developed regions such as North America and Europe accounted for leading shares of the global market in 2018. Large patient population and presence of major pharmaceutical companies can be attributed to high share of these regions. Moreover, rise in prevalence of fungal diseases and increase in the geriatric population drive the caspofungin market in North America and Europe. The market in Asia Pacific is projected to expand at a high CAGR owing to rapidly improving health care facilities in countries such as India, China, South Korea, and Malaysia. China dominated the caspofungin market in Asia Pacific in 2018. The market in India is anticipated to expand at a significant CAGR during the forecast period. Furthermore, increase in investment by leading players and introduction of generics by other players are expected to fuel the growth of the market in the region. The market in Latin America and Middle East & Africa is likely to expand at a steady pace during the forecast period. Prominent players operating in the global caspofungin market include Teva Pharmaceutical Industries Ltd., Mylan N.V , Merck & Co., Inc., Fresenius SE & Co. KGaA , Gland Pharma Limited, and Xellia Pharmaceuticals. This report on the global caspofungin market analyzes the current and future prospects of the market. The report comprises a comprehensive executive summary, including a snapshot that provides overall information of various market segments. The research is a combination of primary and secondary researches. Primary research formed the bulk of the research efforts along with information collected from telephonic interviews and interactions via e-mails. Secondary research involved study of company websites, annual reports, press releases, stock analysis presentations, and various international and national databases. The report provides market size in terms of US$ Mn for each segment for the period from 2017 to 2027, considering the macro and micro environmental factors. Growth rate for each segment of the global caspofungin market has been determined after a thorough analysis of past trends, demographics, future trends, technological developments, and regulatory requirements. A detailed qualitative analysis of factors responsible for driving and restraining the market and opportunities has been provided in the overview section. The report also provides insights into the key trends of the caspofungin market. The report includes market attractiveness analysis of the major segments that provides a thorough analysis of the overall competitive scenario in the global caspofungin market. Market revenue in terms of US$ Mn for the period between 2017 and 2027 along with the compound annual growth rate (CAGR %) from 2019 to 2027 are provided for all the segments, considering 2018 as the base year. The year-on-year growth of the global caspofungin market for each segment is also reflected. Additionally, market-related factors such as favorable reimbursement scenario, expanding distribution channels of caspofungin, and historical year-on-year growth have been taken into consideration while estimating the market size. Based on indication, the global caspofungin market has been segmented into candidiasis and thrush. In terms of distribution channel, the global market has been classified into hospital pharmacies, retail pharmacies, and online pharmacies. In terms of region, the global caspofungin market has been segmented into North America, Europe, Asia Pacific, Latin America, and Middle East & Africa. Additionally, the regions have been divided into major countries/sub-regions. These include the U.S., Canada, the U.K., Germany, France, Italy, Spain, China, Australia & New Zealand, Japan, India, Brazil, GCC Countries, South Africa, Israel, and Mexico. The report also profiles major players in the global caspofungin market based on various attributes such as company overview, financial overview, SWOT analysis, key business strategies, product portfolio, and recent developments. Key companies profiled in the report include Teva Pharmaceutical Industries Ltd., Mylan N.V , Merck & Co., Inc., Fresenius SE & Co. KGaA, Gland Pharma Limited, Xellia Pharmaceuticals, and Novartis AG.